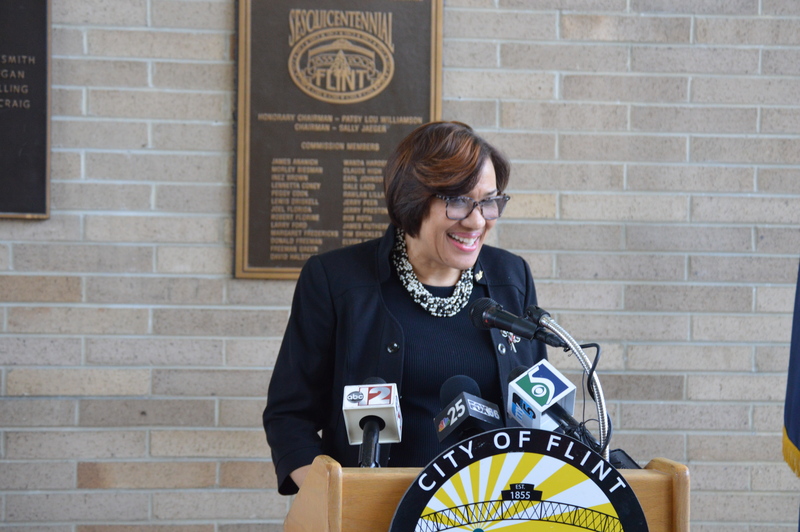 FLINT, MI — Flint Mayor Karen Weaver says plans to remove her as mayor started as soon as she made it into office. Weaver in an interview with Michigan Radio on Oct. 10, 2017, shared her thoughts on recall efforts launched first by Flint resident Alex Harris in November 2016 unsuccessfully and then successfully by Flint resident and now mayoral candidate Arthur Woodson. Woodson launched his recall efforts against Weaver citing a multi-million-dollar trash dispute as his reason for wanting to remove her from office. He initially filed to remove Weaver in January 2017 and withdrew his recall petition saying he met with Weaver and thought some of his issues could be resolved. Woodson later resubmitted language in February saying Weaver did not keep “promises” from the meeting – a meeting that Weaver has never confirmed that she had with Woodson. During the Michigan Radio interview, Weaver also talked about a number of strides she’s made while in office, shared her views on mayoral candidate Scott Kincaid and issues she’s faced with the Flint City Council. LET HER BE: More has been done to benefit FLINT than in the previous two or three Mayorial term that perpetraited the ill on FLINT !!! What are YOU good for besides BICKERING Woodson?? ?